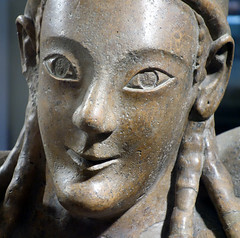 One of the distinguishing features of Etruscan society, and one that caused much shock and horror to their Greek neighbors, was the relative freedom enjoyed by Etruscan women. 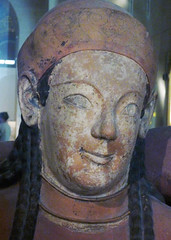 Unlike women in ancient Greece or Rome, upper class Etruscan women actively participated in public life—attending banquets, riding in carriages and being spectators at (and participants in) public events. Reflections of such freedoms are found throughout Etruscan art; images of women engaged in these activities appear frequently in painting and in sculpture. 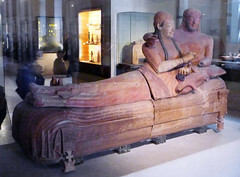 The Sarcophagus of the Spouses was found in Cerverteri, a town in Italy north of Rome, which is the site of a large Etruscan necropolis (or cemetery), with hundreds of tombs. The sarcophagus vividly evokes both the social visibility of Etruscan women and a type of marital intimacy rarely seen in Greek art from this period. In the sarcophagus (and another largely identical example at the Villa Giulia in Rome), the two figures recline as equals as they participate in a banquet, possibly a funerary banquet for the dead. In contemporary Greece, the only women attending public banquets, or symposia, were courtesans, not wives! 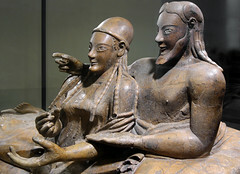 The affectionate gestures and tenderness between the Etruscan man and woman convey a strikingly different attitude about the status of women and their relative equality with their husbands. 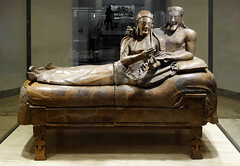 Aside from its subject matter, the sarcophagus is also a remarkable example of Etruscan large-scale terracotta sculpture (terracotta is a type of ceramic also called earthenware). At nearly two meters long, the object demonstrates the rather accomplished feat of modeling clay figures at nearly life-size. Artists in the Etruscan cities of Cerveteri and Veii in particular preferred working with highly refined clay for large-scale sculpture as it provided a smooth surface for the application of paint and the inclusion of fine detail. Handling such large forms, however, was not without complications; evidence of this can be seen in the cut that bisects the sarcophagus. Splitting the piece in two parts would have allowed the artist to more easily manipulate the pieces before and after firing. If you look closely, you can also see a distinct line separating the figures and the lid of the sarcophagus; this was another trick for creating these monumental pieces—modeling the figures separately and then placing them on top of their bed. A really lovely characteristic of this sculpture is the preservation of so much color. 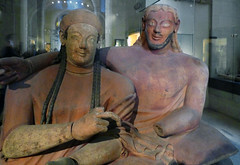 In addition to colored garments and pillows, red laced boots, her black tresses and his blond ones, one can easily discern the gender specific skin tones so typical in Etruscan art. The man’s ochre flesh signifies his participation in a sun-drenched, external world, while the woman’s pale cream skin points to a more interior, domestic one. 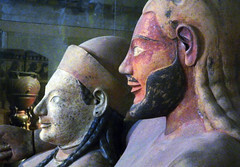 Gendered color conventions were not exclusive to the Etruscans but have a long pedigree in ancient art. 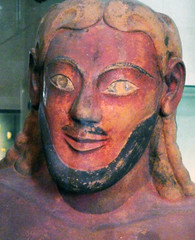 Though their skin and hair color may be different, both figures share similar facial features—archaic smiles (like the ones we see in ancient Greek archaic sculptures), almond shaped eyes, and highly arched eyebrows—all typical of Etruscan art. One of the great puzzles of the sarcophagus centers on what the figures were holding. 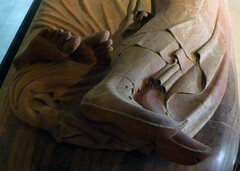 Etruscan art often featured outsized, expressive hands with suggestively curled fingers. Here the arm positions of both figures hint that each must have held small objects, but what? Since the figures are reclining on a banqueting couch, the objects could have been vessels associated with drinking, perhaps wine cups, or representations of food. Another possibility is that they may have held alabastra, small vessels containing oil used for anointing the dead. Or, perhaps, they held all of the above—food, drink and oil, each a necessity for making the journey from this life to the next. 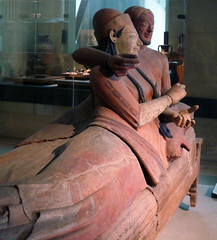 Whatever missing elements, the conviviality of the moment and intimacy of the figures capture the life-affirming quality often seen in Etruscan art of this period, even in the face of death. Cite this page as: Dr. Laurel Taylor, "Sarcophagus of the Spouses (Louvre)," in Smarthistory, August 8, 2015, accessed April 21, 2019, https://smarthistory.org/sarcophagus-of-the-spouses-louvre/.